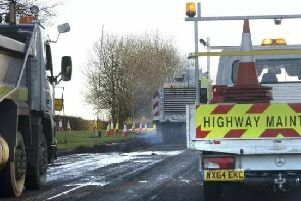 Roadworks set to be removed for Christmas. Highways England is preparing to lift and complete hundreds of miles of roadworks this week in time for the Christmas getaway. Almost 400 miles of roadworks across England will be lifted and completed in December, leaving almost 99 per cent of motorways and strategic A roads roadworks-free in time for Christmas. A still from the special Highways England animation that reminds motorists to check their vehicle before travelling this Christmas. All roadworks will be lifted or completed by 6am on December 22 until 12.01am on January 2 to help people get away this Christmas with as little disruption as possible. With the festive countdown well and truly under way, the UK’s largest coach operator National Express, has praised Highways England for its role in helping people get to their destination on time. Chris Hardy, National Express Coach managing director, said: “We’ll be moving hundreds of thousands of passengers around the UK during the festive period, including on Christmas and Boxing Day when there are no rail services; and New Year’s Day. Make sure you fill up before you leave. And with thoughts turning to the all-important getaway, Highways England is also calling on motorists to do their bit before getting behind the wheel. Its customer service director, Melanie Clarke, said: “We’re doing everything we can to make journeys as smooth as possible this Christmas and that’s why we’re keeping 99 per cent of the road network we manage, free from roadworks. Highways England has also launched a special festive animation which shows Santa carrying out vital checks to his sleigh before embarking on the most important journey of the year - and he’s got a little help from his festive friends, including Rudolph! The animation can be found online at the Highways England YouTube channel. Latest statistics from Highways England show almost half of all breakdowns are caused by basic mechanical problems which could be avoided with simple checks. Furthermore, nearly a quarter are caused by tyre problems; with more than 7,000 cases nationwide of vehicle breakdowns on the strategic road network due to lack of fuel over the course of a year. Motorists can head online to the Think website where they can watch bespoke videos showing how to carry out basic vehicle checks. For more information and to keep up to date with conditions on the roads, visit the Highways England website or by calling the information line 0300 123 5000.